BPEL Process Manager is made to orchestrate services. It's a good tool to sequence the handling of services into a Business Process. In most cases it is evident which services you need to invoke at runtime. But there are cases that you want to be able to choose dynamically which process you want to call. For instance when you want to call services based on the content of a datamodel. You might have services with about the same purpose but with a difference based on a preference. For instance in a certain case different tasks have to be invoked and which specific task in which case is registered in a database. Possibly the task-definitions can be extended with extra tasks. different loan providers. The idea is then that you might want to add loan-providers without changing your process. However, I found that this article is quite complicated and at least pretty complicated to translate into a particular situation. But a Dynamic Partnerlink solution turns out to be quite easy to implement. In this article I'll tell you how. There are a few prerequisites, actually there is one major prerequisite. And that is that every process that you want to call has to be based on exactly the same WSDL. Not just the request and response documents based on a prescribed XSD. But the WSDL has to be literally the same. The message types, the namespaces, port types, bindings. Actually the only thing that at deployment will differ is the endpoint-url. People that have experience in Oracle Workflow calling custom pl/sql workflow functions (standalone or the OWF embedded in E-BusinessSuite), rule-functions in OWF Business Event System or Oracle Streams Advanced Queueing's pl/sql call-back notification functions, may understand the importance of this prerequisite. Java Programmers can see this as implementing an interface-class. document each process need to be able to pass all the relevant information for the calling process to act upon. that resembles a valid function within each other process. Since each process will have the same WSDL think an extra time about if it has to be a synchronous or asynchronous service. After creation of the template process, deploy it to the development server. At that time the WSDL is adapted with the particular endpoint. The invocation process is created as another BPEL process. First step is to create a partnerlink. This partnerlink should be based on the template process that is deployed to the development server. This variable need to be initialized. On contrary to the BPEL Cookbook you only need to initialize the “address” node. If you don't initialize it or if you initialize also the service node you might run into a java null-pointer exception. At least I did. In this case I get the address from a preference from the deployment descriptor. And that's about it. You can deploy this and see if it works, by starting the process and then doing the test again with a “wrecked” end-point url. If the url is broken, the invoke shoul turn into an error. 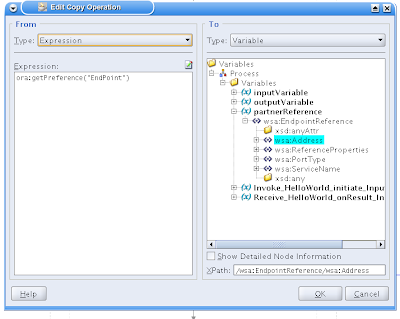 Take the WSDL of the template project and copy and paste it over the WSDL of your newly created BPEL project. The port types have to be changed also. The port types are referenced in the invoke and the receive steps. The input and output variables of the bpel process are based on the message types in the WSDL. If the message types in the WSDL are based on local XSD's (with in the project, not on a HTTP-Server) the you have to copy the XSD to your new project too. But I would especially in this case recommend to put the XSD's to a HTTP-Server. In that case a change in the XSD would immediately count for all the processes that are based on them. This should be about it. Now you can implement your new BPEL process. Then deploy it and test your dynamic invocation by copying the endpoint of the new BPEL process and register it in your Invocation Process. Is this still the best and most efficient way to do this in 11g? 11g did not change at this point as far as I know. OSB has some possibilities to abstract end-points. But that would not work I suppose if you want to choose the definite endpoint base on some program logic. But it would be a nice quest to look for an alternative. Here I don't understand the 2nd point(Create a separate XSD for the request and response document and put it on a http-server (for instance the document-root on the Oracle HTTP Server of the SoaSuite). You mean the ws-addressing.xsd file must be in (schemaLocation="http://Localhost:8888/orabpel/xmllib/ws-addressing.xsd") server side. Pls clarify me. The processes all use the same structure (input and output documents) but have their own wsdl. The wsdl's in itself will have to be similar, but each has it's own version. 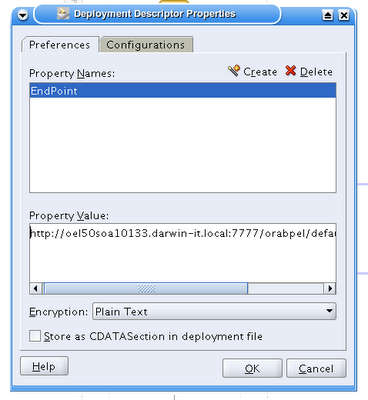 The xsd's for the input and output documents can however be shared. So it is recommended to have the shared xsd's for the input and output docs on a seperate http-server. Hope this will make it clear for you. Thanks for your reply. I have got clarity on it. I have one more question for you. 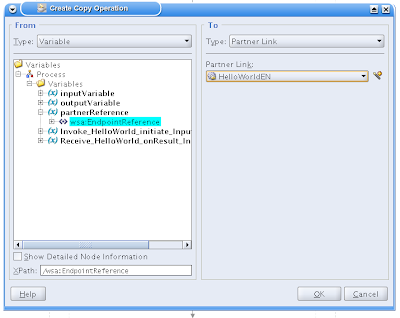 Here I am creating dynamic partner link to call OSB service in my BPEL process. I wan make it dynamic to change run time server address and port numbers. Here I am getting Error (Error occurred reading inline schemas) while creating reference variable as per BPEL cook book. My question is Do I need to have ws-addressing.xsd file in server side?, If at all where I can keep in server side. I couldn't find /orabpel/xmllib/ws-addressing.xsd path in server side. We are using SOA11g and OSB10.1.3..
You don't have to explicitly deploy in any way the ws-addressing.xsd. BPEL already has/knows it "by heart". I don't know where it resides explicitly or implicilty in 11g. But you should not have to do anything with that. I think you should check your namespaces and imports. Although I would be happy to help you out, you would be better off posting this question in more detail on the SoaSuite forum: http://forums.oracle.com/forums/forum.jspa?forumID=320. There are a lot more people to help you and there you can also post your code snippets, so you can be helped cross-checking your imports. This works without issues. However fault policy do not work. I tried applying the retry policy using fault bindings and fault policies xml, however it doesnt seem to work. I've no current setup to try this. But since Oracle AIA 11g relies on both dynamic partnerlinks and errorhandling framework, I'm surprised by your findings. Maybe you could ask on the Oracle Forums and/or Oracle Support. I would appreciate if you coulc commment your findings back.